Vastly different from their smaller, lighter weight, and cheaper counterparts, professional drones are heavy duty pieces of machinery that are equipped with an arsenal of performance accessories to result in a multifunctional tool that is readily capable of taking on a remarkable array of tasks. Featuring longer flight times, extended battery life, increases in range, and a bevy of safety features, professional drones come complete and ready to use out of the box for nearly any type of commercial application imaginable. Consumers can opt for many high-end features and accessories to customize a drone to their highly specific needs. If you are interested in purchasing a brand new professional drone, read on below to discover valuable information about the top five best models available for 2018! A true sight to behold, the DJI Phantom 4 Quadcopter is equal parts gorgeous aesthetics and state-of-the-art action. 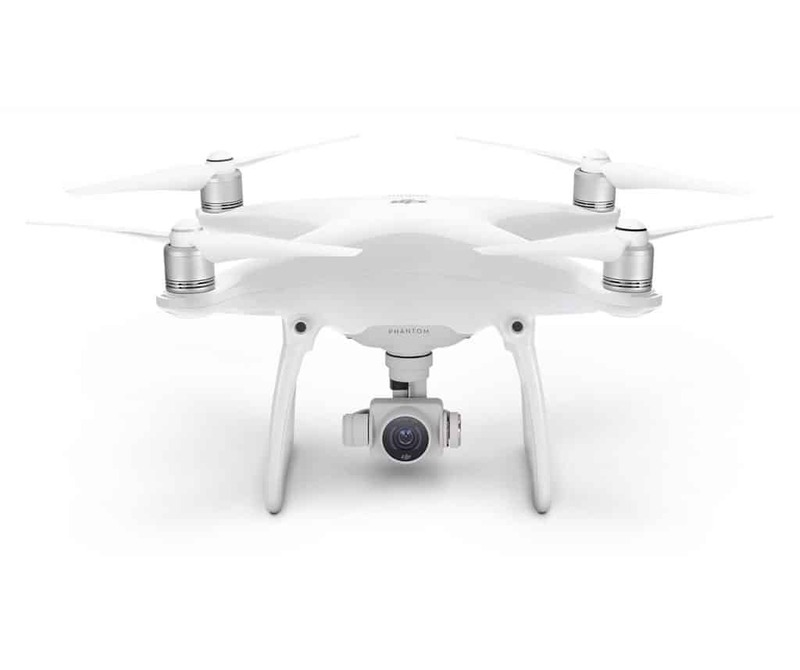 Styled in an eye-catching crisp and clean white, this professional drone showcases a symmetrical construction with gleaming silver accents and a state-of-the-art camera optimally positioned for breathtaking aerial footage. Consumers will love the performance attributes of this drone, most notably the sport mode capability, extended flight time, visual tracking, and precision hovering. Marketed by DJI as the foremost representation of drone evolution, the Inspire 1 features a heavy-duty, rugged countenance with its assemblage of industrial grade materials and lightweight components rendering it among the fastest and most agile drones available on the market today. Among the most notable highlights for this product include comprehensive app control, remote focus, and intelligent flight modes. The DJI Phantom 3 Professional is a venerable best-selling product on the consumer market that has enjoyed substantial acclaim. The Phantom 3’s GPS integrated hovering system enables users to pinpoint locations with the utmost accuracy while the precision hovering components guarantee a smooth and seamless flight in the air. With its unique looks and gold embellishments, the Phantom 3 is a drone encompassing a substantial appearance in addition to impressive performance in all aspects of use from takeoff and beyond. 3DR’s Solo Quadcopter is a perennial best seller for agriculture, farming, and construction professionals. With its best in class sensor ratings, the Solo Quadcopter is an essential piece of equipment used in an assortment of commercial and professional enterprises to increase profits and production alike. The Solo Quadcopter impressively rated sensor is the largest sensor available on the market for professional drones weighing under five pounds. With its accompanying Site Scan software, this remarkable drone is easily able to create precision data from detailed maps, surveillance and more. An incredible buy, the DJI Mavic Pro Bundle combines an assortment of all the best performance accessories while also taking the guesswork out of consumer purchase decisions. This state-of-the-art drone comes complete with two additional batteries, two additional propellers, a quick-charging hub, a convenient car charger, a power bank battery adaptor, and a handy shoulder bag. Heightening the convenience virtues of this bag is an innovative design that folds down from a full-size drone to minuscule dimensions similar to those of a water bottle. The ability to fold the drone down to these incredible dimensions make it exceptionally easy to carry, store, and transport across all journeys. There is a vast array of professional drones available on today’s consumer market. Buyers can choose from a bevy of accessories, software, and performance attributes to obtain the perfect drone to boost their commercial enterprises in substantial ways.